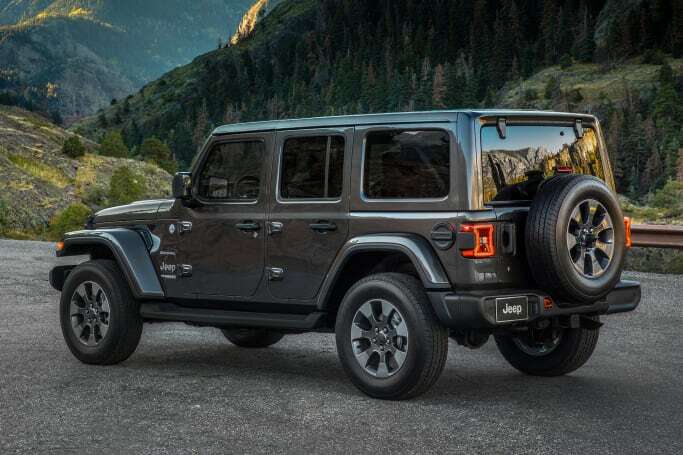 It might look like a mere facelift, but the JL Wrangler is all-new from the ground up, and promises more off-road ability, fuel efficiency, power, tech, and refinement than ever, while also reducing weight. When the first official pics emerged at the start of November, picking the depth of changes made to the new Wrangler required serious trainspotting skills. This matters little, as Jeep is well aware of the fanatical anticipation among the Wrangler’s loyal fan base for even the tiniest of design tweaks. Aside from the visible bolt-ons like new headlights and grille, wheels, fenders and extra body vents, the Wrangler development team’s deliberate restraint actually hides an all-new body and chassis, with new drivetrains and improvements in every key area. Speaking with CarsGuide at a private media preview on the eve of this week’s Los Angeles motor show, Jeep executives explained the painstaking process in developing an all-new model with the weight of the entire Jeep brand on its shoulders. 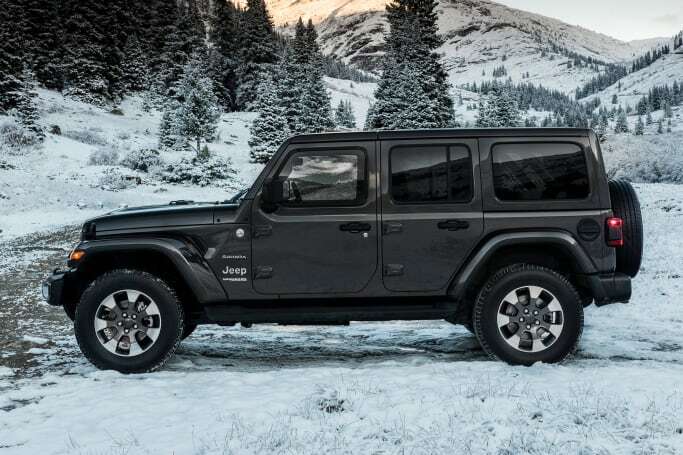 Given its role in defining Jeep’s core values since the first Willys Jeep served US troops in World War II, developing a new Wrangler is akin to replacing the Porsche 911 or the likes of Mazda’s MX-5, but arguably more of a challenge. Non negotiables like the solid axles at each end, characteristic profile and seven-slot grille and circular headlight face were defined early in the program, all of which aren’t an obvious fit with ever-tightening requirements for safety, efficiency and refinement. Nearly 11 years after the current JK model appeared at the 2007 Detroit motor show, both the two-door Sport and four-door Unlimited versions ride on longer wheelbases to create room for the addition of the 850RE eight-speed auto from the Grand Cherokee and 300 sedan. The Sport grows by 34mm to 2458mm, while the Unlimited adds 60mm to also benefit rear seat occupants to now measure 3007mm. The all-new body uses weight-saving aluminium for the doors, hinges, fenders, windscreen frame, and tailgate skin, with the latter also boasting a magnesium frame. Other measures include hollow track and stabiliser bars, aluminium engine mounts and steering gear, and a lighter master cylinder. Jeep is yet to quote overall weight figures, however. US models also get an aluminium bonnet, but export models will use a steel pressing to help it meet stricter international pedestrian safety rules. You might be surprised to find the Wrangler’s characteristic external bonnet latches still manage to sneak under the pedestrian safety radar, but they have been redesigned and moved closer to the front of the car for this purpose. Mark Allen boasts these are just the third design ever used on a Wrangler, and the new units feature a winch cable retention slot to help with off-road recovery situations. Thankfully for right-hand drive markets like Australia, these cable slots appear on both sides of the car. The windscreen still uses flat glass (in 2018!) but has been treated to a couple of extra degrees of rake to aid aerodynamics, which along with numerous other detail tweaks including the softer leading edge of the bonnet and grille, have helped improve its slipperiness by nine per cent, to an admittedly still truck-like 0.54 Cd. The JL Wrangler is all-new from the ground up. The Rubicon is more visually distinguished than ever, sitting taller thanks to bigger 33” tyres. Cabin designs are vastly improved. Low range is still selected by an old-fashioned cabin lever. The hard and soft top roof options remain. You might be surprised to learn that the windscreen is still able to be folded flat, despite significant reluctance from most departments within Jeep, and little demand from consumers. The design team somehow overcame these challenges and this characteristic has been retained for all versions of the JL, with a new four-bolt release system simplifying the process significantly from the existing 28-bolt setup. When folded, the A-pillars are now joined by a new header bar, which no doubt strengthens the now-body colour passenger-protecting sport bar, and also means the rear-view mirror remains in place with the windscreen folded. Other design details include larger windows all round and a lower-mounted spare tyre to improve visibility. The luxury-focused Sahara only available with the four-door body. The Rubicon is more visually distinguished than ever, sitting taller thanks to bigger 33” tyres (32” for export markets), plus narrower fenders that are mounted higher up for extra clearance. Science fiction nerds will appreciate that the details within the new LED headlights fitted to upper models were inspired by the electrobinoculars from the original Star Wars trilogy. Another subtle detail is that the new Wrangler is the only new Jeep to still feature the Jeep logo on its flanks, rather than the usual corporate policy of the nose and tail. These flanks also house new functional extraction vents to release underbonnet pressure and alleviate bonnet flutter at high speeds. The Rubicon gets additional bonnet vents for allowing heat to escape during lengthy low-speed off-road climbs. The hard and soft top roof options remain, with the soft top designs vastly improved with the use of slide out vertical panels that also give you the option of a safari-style top. The soft top is also now available with an optional electrically retracting top section. JL trim levels from launch are defined as Sport, Sport S and Rubicon, with the luxury-focused Sahara only available with the four-door body. Cabin designs are vastly improved, with an abundance of soft and rubberised surfaces and clever design details like interior door handles that also make it easier to lift the door when removing it - as one does with a Wrangler. This job is also made easier by having the required Torx bit tool size stamped directly into each door hinge. The JL’s fourth-generation 'Uconnect' multimedia system brings Apple CarPlay and Android Auto to the Wrangler for the first time. 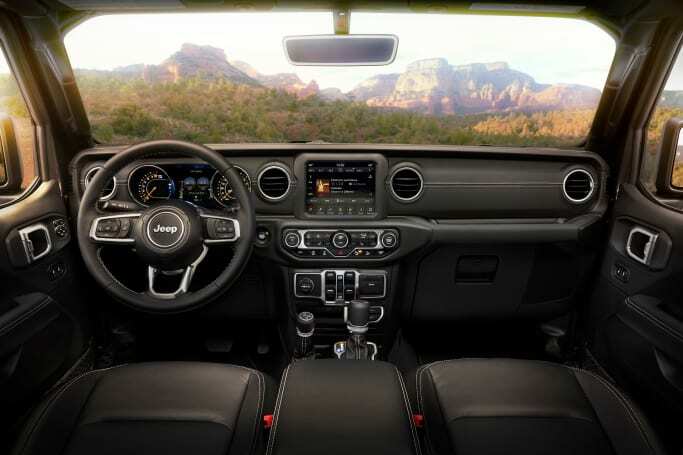 The JL’s fourth-generation 'Uconnect' multimedia system brings Apple CarPlay and Android Auto to the Wrangler for the first time, and a range of 5.0-, 7.0- and 8.4-inch screen sizes depending on trim level, with pinch-and-zoom capability. There’s also extra USB and 12-volt points, plus the availability of an inverter for running larger appliances. 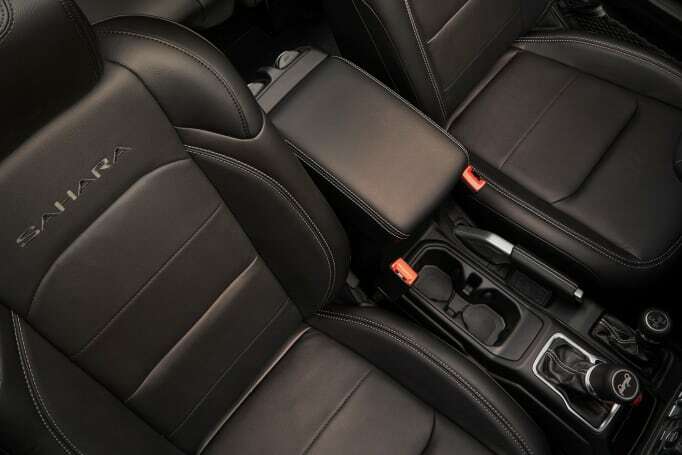 The centre console has a dedicated mobile phone slot adjacent to the dual cupholders, while all models get directional air vents and dual cupholders in the rear footwell. Unlimited models get an extra pair of cupholders in the rear-seat armrest and there are flexible nets in each door for swallowing bottles. Both bodystyles get dual ISOFIX points on the back seat for mounting child seats. The centre console has a dedicated mobile phone slot adjacent to the dual cupholders. Aside from claiming that safety has been improved, Jeep is yet to confirm specific details about features, including whether AEB is able to be integrated into the folding windscreen design. The current two-door, 3.6-litre model was given a four-star ANCAP rating when tested in 2012. 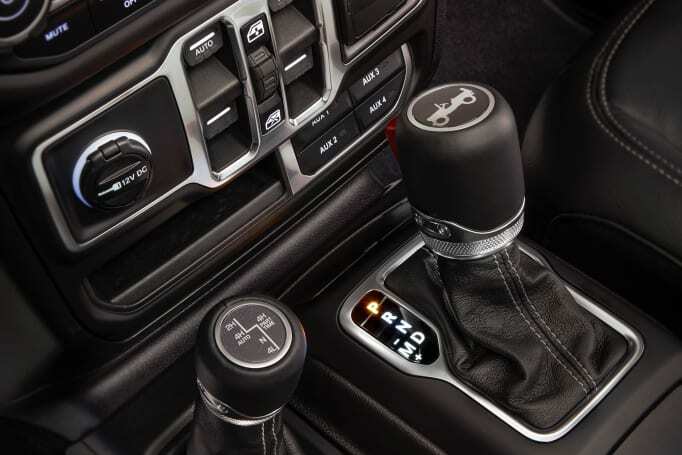 Aside from the new eight-speed auto, a new six-speed manual has been developed to be paired with a revised version of the 3.6-litre 'Pentastar' V6 petrol engine, which now features a stop-start function to boost economy and an exhaust-gas recirculation system to improve emissions, with outputs bumped from 209kW/347Nm to 213kW/353Nm. Given Australia’s preference for automatics though, we wouldn’t be surprised if we missed out on manual versions. Full-time four-wheel drive (branded 'Selec-Trac') will appear for the first time on the Wrangler. The big news under the Wrangler’s bonnet is a trio of new options, with a new 201kW/400Nm 2.0-litre twin-scroll turbo petrol engine joined by a 194kW/599Nm version of the Grand Cherokee’s 3.0-litre V6 turbo-diesel in the US. The V6 diesel has only been developed for left-hand drive, however, while export markets will use a new (as-yet unrated) 2.2-litre turbo-diesel four instead. Wrangler chief engineer Brian Leyes confirmed that the 2.2 diesel will be available with the Rubicon, marking the first time the off-road focused variant will be available with diesel. US versions retain the same maximum tow rating of 3500lbs (1587kg) as the JK model, but Leyes confirms the current Australian max rating of 2300kg will be matched when it arrives Down Under. Full-time four-wheel drive (branded 'Selec-Trac') will appear for the first time on the Wrangler, with two different set-ups being employed across the range. All bar Rubicon models use the 'Command-Trac' set-up with 2.71:1 low range ratio and 3.45:1 final drive ratio in new Dana front and rear differentials. The Rubicon uses the 'Roc-Trac' set-up with a shorter 4.1 low range ratio, and heavier-duty Dana 44 axles with a shorter 4.1 final-drive ratio and 'Tru-Lok' differential locks for ultimate traction in off-road conditions. This, combined with the new transmissions has boosted the overall crawl ratio for the auto from 59-77:1, while the manual manages 84.2:1. Notably, low range is still selected by an old-fashioned cabin lever, rather than the button actuation used by most four-wheel drives these days. Every Wrangler model wears a 'Trail Rated' badge to signify its capability on the famed Rubicon trail, helped by standard skid plates and front and rear tow hooks. The Rubicon also adds heavy-gauge tubular steel rock rails to protect the sills. Overall clearance has also been improved, with the Rubicon boasting a 44 degree approach angle (up 11), 27.8 degree breakover (up 5.8) [for the Sport, no figure yet quoted for the Unlimited] and 37 degree departure angle (up 9), with 277mm of ground clearance and 200mm of articulation. Despite the longer wheelbases, Jeep claims that the turning circle measurements have also improved, which would help in tight off-road situations. The existing 760mm wading depth has been retained, which is just 40mm short of the Ford Everest industry benchmark. Jeep says that the JL is the most tested Wrangler ever, having accrued 6.3 million kilometres in testing across the USA, Brazil, Italy, India, China, and New Zealand, with final validation testing set to continue in Australia in 2018. The first US deliveries of the new Wrangler are set for January, while an Australian arrival is expected some time in the third quarter. What do you think of the new Wrangler? Tell us what you think in the comments below.